I have always be jealous of the websites that have little thumbnails show up next to their recipes on Google. Turns out that you have to specially encode your recipes in order to do that. It is not too hard to do, you just need to provide extra context for Google about the different parts of a recipe. That helps search figure out what type of ingredients your recipe needs and what is a good photo for it. You can of course do this all by hand… but that is a lot of work. Luckily, there are WordPress Plugins you can use that help. I found most of them to be clunky, so I took the recipe entry format I used on NoshBot.com and turned it into a WordPress plugin. 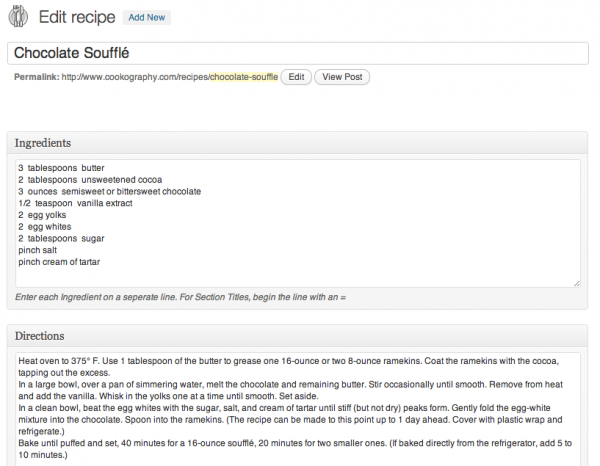 Recipe Schema is a WordPress Plugin that lets you easily enter and manage recipes on a WordPress site. It encode the recipe in the Schema.org microdata format, which is supported by Google, Bing and Yahoo. Recipe Schema also make it easy to print out the recipes and share them on Facebook. Give it a try and let me know what you think. Is it useful? Any features you would like to see? I’d love to see it import the code directly into the html of the post, and have the option to embed but hide certain attributes (“directions” “yield” “cook time”) as I don’t care for the formatting nor do I want to include the information up front, but still want the sections of my post identified correctly.